My sister and her husband gifted us with a trip to the Santa Barbara Zoo over the holidays. I’m not much for zoos because I feel sorry for the cooped up critters and spend my time not enjoying them, but plotting their escape. This zoo, however changed my opinion. It’s small, well cared for, and the animals seemed if not content, peacefully resigned to their habitats. The highlight was feeding the giraffes. 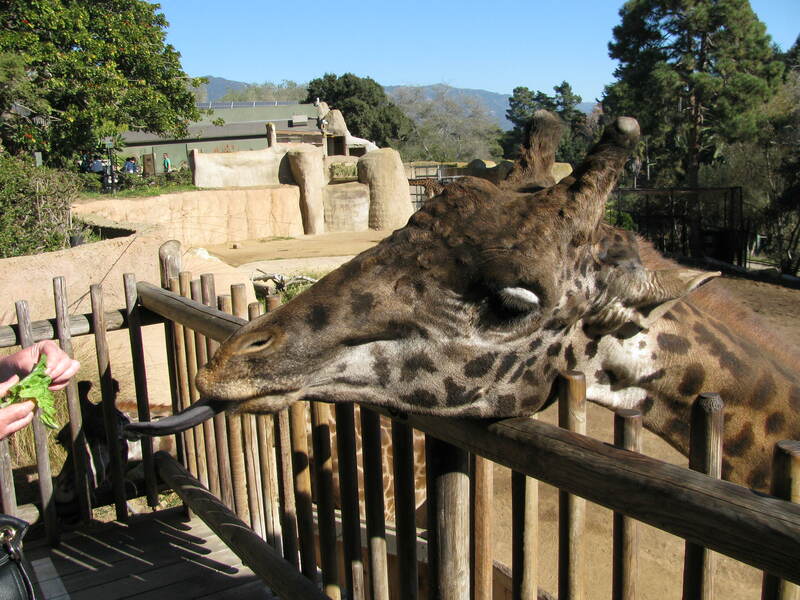 The docent gave me a handful of lettuce leaves, and told me to offer them to Michael, the alpha giraffe who was at the railing following my every move. Michael was three stories high, wore an apricot-brown colored coat, with liquid brown eyes, and long dark lashes. I offered him a lettuce leaf, and in a blink, Michael rolled out a very long grey tongue, and with the dexterity of fingers, grabbed the leaf, rolled it into his mouth and chewed. It was a real tongue and cheek experience. He consumed the leaves in a nano-second and never said thank you. The snow leopards were my next favorite, but they had just woken up and were in no mood to be sociable. Or maybe they’re always that way. True introverts who only want the comfort of their cave. The penguins were the most gregarious, honking their way through their morning bath, as were the two red amazon parrots squawking from their perch as they preened each other. I did feel sorry for the two elephants. They could have benefited from a good book or a stimulating conversation. The flamingos ignored us and bent their necks into their wings and went to sleep. But that’s what flamingos do, especially in Vegas, decorating people’s front yards. There was an enormous grey-headed vulture, the size of a small car, in his cage with a docent who was cleaning his habitat with a broom and dust pan. She moved, he loped, following her like a shadow all around the cage. We named him Hitchcock. I’ve never understood why zoos don’t have a pet purchase policy. I would have emptied the place out. Except for Hitchcock. I don’t like stalkers.